The extra headhaul loaders included nine ships operated by MSC and four each from Maersk Line and CMA CGM. 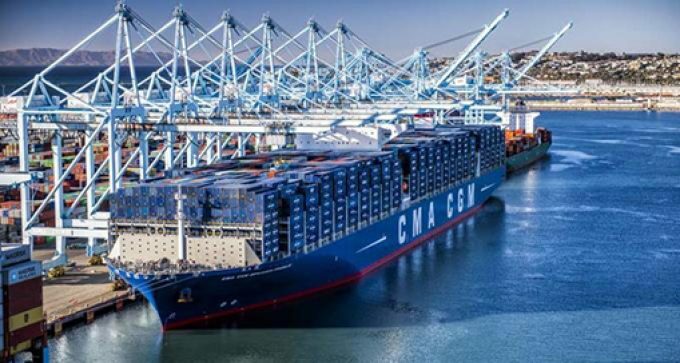 Alphaliner also noted significant upgrades on three China-US west coast sailings during the same period, with Maersk temporarily substituting two 13,000 teu vessels with 17,800 teu ULCVs and OOCL replacing an 8,800 teu vessel with a 13,200 teu ship. Transpacific carriers have been taking advantage of the cargo rush to push up spot rates, which for both the US west and east coast ports soared more than 100% higher than in the same weeks last year. Ultimately, the cargo front loading proved unnecessary as an eleventh-hour deal was struck between the US and China at the G20 summit in Buenos Aires, postponing the higher tariffs for 90 days to allow time for negotiators to strike a broader trade agreement. However, depending on the rhetoric, as the clock ticks on the 90-day postponement, Alphaliner said US imports from China could see a further bout of front loading in the first quarter of next year. For now, however, the transpacific demand spike has eased, with carriers expecting a drop in forward bookings. And container lines have reacted to the softening in demand by blanking a number of sailings this month. “Carriers already anticipate a drop in bookings, with at least six sailings due to be cancelled from week 49 onwards,” said Alphaliner. The consultant noted that the Ocean Alliance had announced the cancelation of four sailings from Asia to the US this month, while THE Alliance plans to withdraw two voyages. Carriers are endeavouring to underpin spot rates on the transpacific eastbound route, which have seen double-digit declines in the past two weeks on the Shanghai Containerized Freight Index (SCFI), to stand at $2,190 per 40ft for the west coast and $3,403 per 40ft for east coast ports. During the Ocean Network Express (ONE) investors’ meeting in Tokyo last week, chief executive Jeremy Nixon said container shipping would have to “adjust to fast changing trade flows” if part of the around 60% of all transpacific US imports that come from China had to be sourced from elsewhere in Asia. Mr Nixon said the “exact effect” of the US-China trade measures was “hard to predict”, and that for US importers to downscale their supply chains from China and transfer to other countries would, in reality, be “quite challenging”.